I love me a cracker outta the box as much as the next gal, but I'm wary when I read the listed ingredients and can't pronounce half of them. 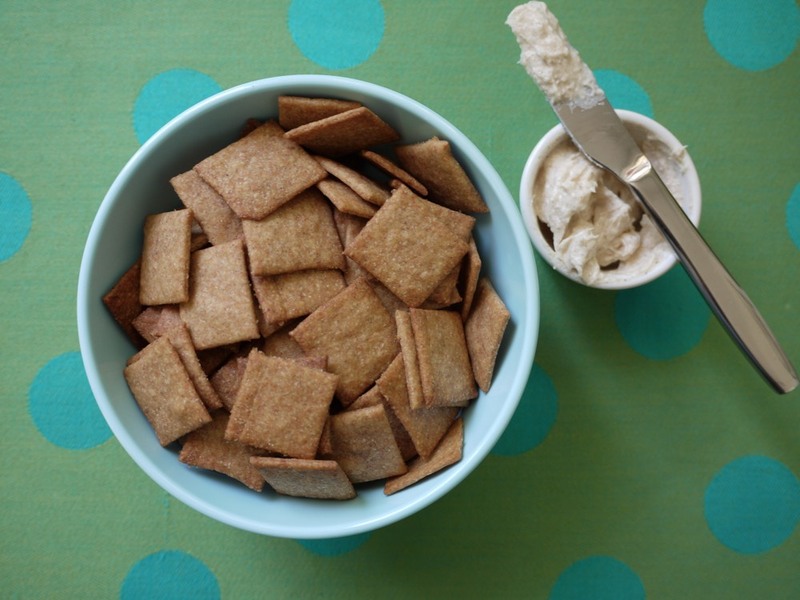 There are only seven -- count 'em, seven -- ingredients in these Cinnamon Honey Wheat Thins and I'm betting you've already got all of them in your kitchen. Is it easier to go to the market and by a box of wheat thin crackers? Of course it is. But I guarantee that you're not going to find a sweet version that are as naturally crunchy, tasty, and entirely pronounceable as these! 2. In the bowl of a food processor, combine the flour, salt, cinnamon, and butter. Pulse until the mixture resembles fine crumbs. 3. In a small bowl, whisk together the honey, water, and vanilla and add it to the food processor. Pulse until a dough forms. 4. Remove dough and split into four equal portions. Roll out each portion as thin as you can, about 1/16 inch. 5. Cut dough into 1-inch squares and carefully move them to a Silpat-lined baking sheet. 6. Bake for 5-8 minutes, or until crackers are golden brown. Keep your eye on them as they can burn quickly! 7. Move crackers to a cooling rack to cool and serve with Honey Cream Cheese Dip. 1. Place the ingredients in a bowl, stir to combine and serve with crackers. Wow, these sound yummy and so easy. I may have to try these! These look delicious and sound so much better than store bought! Can these be frozen before baking? I can't imagine using 16 dozen crackers before they go bad lol. Yes, they can be frozen before baking. Just move quickly when you move them from a sheet to freeze into zipper bags or a container. wow do they look great!! I roll your graham cracker recipe out directly on a silpat then score them with a pizza wheel. They break apart easily after baking. Would that work with these or do they rise more and seal the scoring marks? Thanks! I love you! I've never even tried that. What a FABULOUS idea!! I say try it with these crackers. The dough acts similar to the graham crackers, but you really need to roll this dough very thin for them to turn out crispy. Yum can't wait to make these! These look awesome! I love baking, and just so happened to have ordered a Silpat mat last night. I can't wait to make these this weekend! Can I substitute anything for the silpat?? You could also make them on parchment paper, but I found that they got too dark too fast right on the baking sheet. They turn out better when placed on a silpat or parchment. Silpats are a great investment for making cookies, crackers and fruit leather. Can I make these with unbleach all pupose flour, that's all I got in my kitchen right now! Yes, all purpose flour is great! YUM - I cannot wait to try these! My kiddos gobble up Wheat Things! Amanda - I have used a stoneware baking sheet instead of Silpat with success before. Is honey okay for baby &gt; 1 year old if it's baked? Honey, cooked or not, is considered unsafe for baby. Any possible botulism spores in the honey will not be killed off by cooking. These sound great! I'll have to give them a go. I always err on the side of caution and stay away from honey for babies under 1-year-old! Everyone talks about the safety of baby eating honey. Did you know that it also includes corn syrup? Most of us have thrown out corn syrup a long time ago, but I know my own mother uses it for baking. The foods most commonly contaminated are home-canned vegetables, cured pork and ham, smoked or raw fish, and honey or corn syrup. About 110 cases of botulism occur in the U.S. per year. Most of the cases are in infants. Fabulous! We, too, love crackers but it is so hard to find ones without a scary list of ingredients. Would love a Ritz cracker type recipe if you're looking for something to experiment on. Thanks for all the great recipes!! Lorraine's recipes are super sepaicl, it's true Ava. They are all written in her fabulous handwriting and I keep them in a sepaicl folder, a true treasure.If you would like to come with me for high tea, you are invited! Debra, that is good to know about the prices being lowered off season. It's the main reason why I did not go. I can just imagine going in the autumn, it would be so beautiful. Oh I love that marina. My heart is so homesick, Victoria is such a beautiful city.OMG, the Zombie Walk??!!! That would have totally made my day! Zombies and high tea, two of my favourite things. I love when the spooky and foodie worlds meet. That is joy, thank you for sharing that story, I LOVED it!!!! Could you make these with out a food processor? I broke mine and haven't gotten a replacement yet. Have you ever had a weird taste result from baking things on silpats? I have bother silpat brand and the crate and barrel ones. My husband finally insisted we throw them away. Everything I baked on them tasted weird to him and once he mentioned it, I noticed it, too. We had the same problem with the silicone baking cups. I use parchment instead, which I hate because it is so wasteful (why I bought the silpat to begin with). That is so weird! I agree about the wastefulness of parchment, which is why I love Silpat. I have never noticed a weird taste when using them. I agree with Jennifer! Substitute whatever spice you prefer! I would say the closest flavor to cinnamon would be nutmeg. In the Honey Cream Cheese dip - how much ground cimmamon? Thanks! For this recipe you can mix it all by hand, or with a pastry blender! Is the butter right out of the fridge, softened or melted? right out of the fridge! It doesn't need to be super chilled, but definitely not softened or melted! Any ideas on how to turn this into a more savory cracker?...i'm thinking garlic herb. Replace the cinnamon with something savory! Paprika, onion powder, garlic powder, whatever you want! Not yet, but I am working on getting nutritional information on all my recipes! For now, websites like Sparkpeople and My Fitness Pal are great resources! look nice, by the way you wrote 2 tablespoons of honey twice. and can you replace the honey with rice sirup. Just made these today! Very easy to make and roll out, made for a quick way to make snacks! Thank you! My daughter cannot have dairy. Is there a good sub for the whipped cream cheese? The whipped cream cheese is just to make a dip or spread for the crackers! It isn't an ingredient for the crackers themselves so you can leave it out! Just made these gluten free using coconut flour. Pretty good! Made these the other day and it was almost as if I didn't. They disappeared! I made them for my extremely picky 3 year old who actually wouldn't even try them but as I'm causally eating them in front of her commenting on how tastey mommy's new crackers are I found out that, HEY, these reallly ARE freakin' delicious! I tucked them away for the day and decided I'd try again the next morning and when I went to get them, they were gone! Sneaky husband of mine snaked them all! So I'll be making them again soon...a double batch. I'm trying the chocolate zucchini bread tomorrow. I really need this chick eating more than chicken, yogurt, juice, and \"fiber cookies\". Her father and I are such big foodies too, I don't know where she got her finicky taste buds! Oh but she does drink soy milk smoothies with prune juice and pea puree AND will tell you \"mmmmm DELICIOUS!\" Gross....whatever. You my dear, are AMAZING! I fell in love with your blog right away!!! I linked your page from my blog because you have AMAZING recipes!! Im a newbie in this blog thing, and you are inspiring! Thank you! I haven't tested it with a gluten-free flour, but I think it would work, especially if you already know how to use gluten-free flour! Hi can I substitute the honey in these with sugar or another sweetener. I want to make these for my little one as a snack, but because he is not of the honey eating age which is around two right? I would need to find another sweetener. You can begin trying honey around 12 months... of course consult your pediatrician first! I haven't tested these with something other than honey, and I'm not sure how that would work since it's such a small amount. You could substitute agave at a 1:1 ratio and come out with the same end product! You could also try using 1/4 cup sugar, and you will have to increase the water to help the dough form. this was one of the recipes on the freeze well list... when do you freeze them? Freeze them after baking! They're so thin that they will defrost on the counter quickly! Just took these out of the oven and my toddler has already eaten five (minus the spread). Looks like these will be on our snack food lineup. Very easy to make., but I had use more flour for rolling. Sadly these did not turn out good for me. Not much flavor. I didn't make the cream cheese mixture so maybe that was the problem but I was just looking for crackers for my little ones. Can I just use parchment paper to bake?